Notes: Among adults 18–64 years of age. Health insurance coverage is based on the status at the time of interview. Private includes plans obtained through an employer, purchased directly, through local or community programs, through the Health Insurance Marketplace, or a state-based exchange. Medicaid includes those without private insurance who reported Medicaid, Children’s Health Insurance Program, or other state-sponsored health plans. 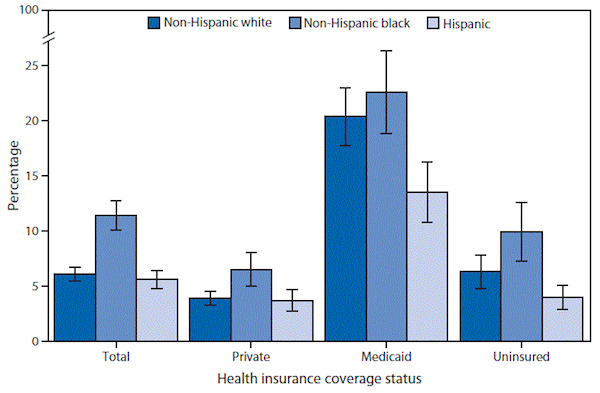 Uninsured includes those without any private health insurance, Medicaid, Medicare, other government-sponsored health plan, military plan, or Indian Health Service coverage only, or those who had a private plan that paid for one type of service. Persons of Hispanic ethnicity may be of any race or combination of races. Estimates are based on household interviews of a sample of the civilian noninstitutionalized U.S. population and are derived from the National Health Interview Survey family core and sample adult components. Data Source: Gindi RM, Black LI, Cohen RA. Reasons for emergency room use among US adults aged 18–64: National Health Interview Survey, 2013 and 2014. National Health Statistics Reports, No. 90. Hyattsville, MD: National Center for Health Statistics; 2016. http://www.cdc.gov/nchs/data/nhsr/nhsr090.pdf. This entry was posted in Data Watch on March 2, 2016 by Genevra Pittman.